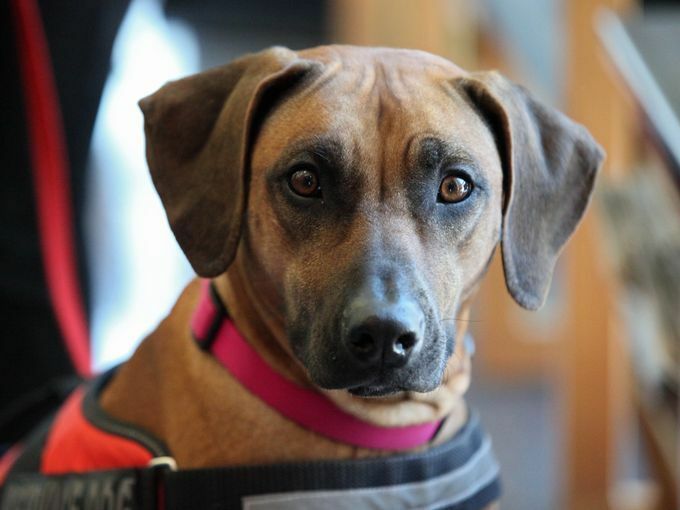 Each morning, Cali, a four-year-old Rhodesian ridgeback, greets pre-K through 12-plus students as they walk through the doors of The Calais School. She’s checking their stress levels. The fifth grader was going to have a meltdown, but Cali–a cortisol detection dog that works full time at a school for children with special needs– picked up the scent from across the building. She nudged Casey Roerden, her trainer, handler, and a health education teacher, at The Calais School. “Time to go,” Roerden said. When the student spotted Cali heading her way, she got distracted. “Cali is a welcome distraction,” says Roerden. The student turned her attention to the dog. Her anger dissipated. While her focus was on Cali, Roerden talked to her about her feelings and as a reward for calmly expressing herself, she got to pet the dog. About 85 children attend The Calais School, based in Whippany, New Jersey. Many of the students are on the autism spectrum; some have attention deficit disorder, oppositional defiant disorder, and other challenges that can trigger anxiety and other difficult emotions. Cali was trained to detect rising levels of cortisol, which is the stress hormone our adrenal glands secrete when we become anxious or stressed. When we are agitated, cortisol levels in our bloodstream rise and put out a scent that we can’t smell. Dogs, however, can. It’s Cali’s job to let Roerden know if a student’s cortisol levels are high. Cali is one of three working dogs at The Calais School. Sage, a German shorthaired pointer, and Cleo, a beagle, are both rescues. They are part of the school’s Animal Adaptive Therapy program. 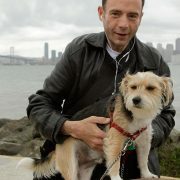 Sage joined the program after Roerden adopted him. He works as a substitute for Cali. Both Cali and Sage live with Roerden. Cleo works with the school’s occupational therapist. She helps students practice fine and gross motor skills. She often wears a vest with laces, zippers, and buttons. She and the occupational therapist teach the children how to tie shoes, zip zippers, and button buttons. A few of the students read aloud to her, too. A dog’s ability to smell odors is beyond our comprehension… That is why dogs are used to detect melanomas, diabetes, and other types of disease. “The dogs don’t bark, jump up on the students, and are always accepting,” says Roerden, who is also a certified specialist in natural canine behavior rehabilitation and in animal adaptive therapy. A ninth grader agrees. “Cali can help us cope with our problems so that we don’t have to get through it by ourselves,” he says. 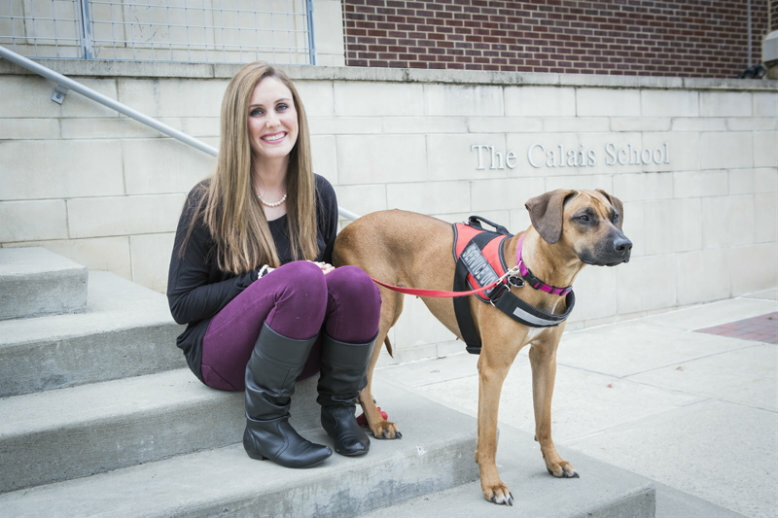 The Calais School will expand its Animal Adaptive Therapy program. They have plans to bring on graduate level interns from Kean University and New York University majoring in occupational therapy, speech therapy, and social work to be trained in animal adaptive therapy. School officials deeply believe that their Animal Adaptive Therapy program has been so beneficial that they welcome inquiries from other schools that specialize in working with children with special needs who want to create similar programs. After all, there’s nothing better than a dog’s love in your life to make all your other problems fade away.